Thin Places tours go deep into the Celtic landscape. We bring guests to ancient and sacred sites in Ireland and Scotland exploring areas not often seen in big tour groups or self-drive tours. Though these are spiritual tours, they are not religious or affiliated with any type of organized religion. Guests are guided by a storyteller/guide, and allowed to travel slowly through some of the most mystical scenery in western Europe. 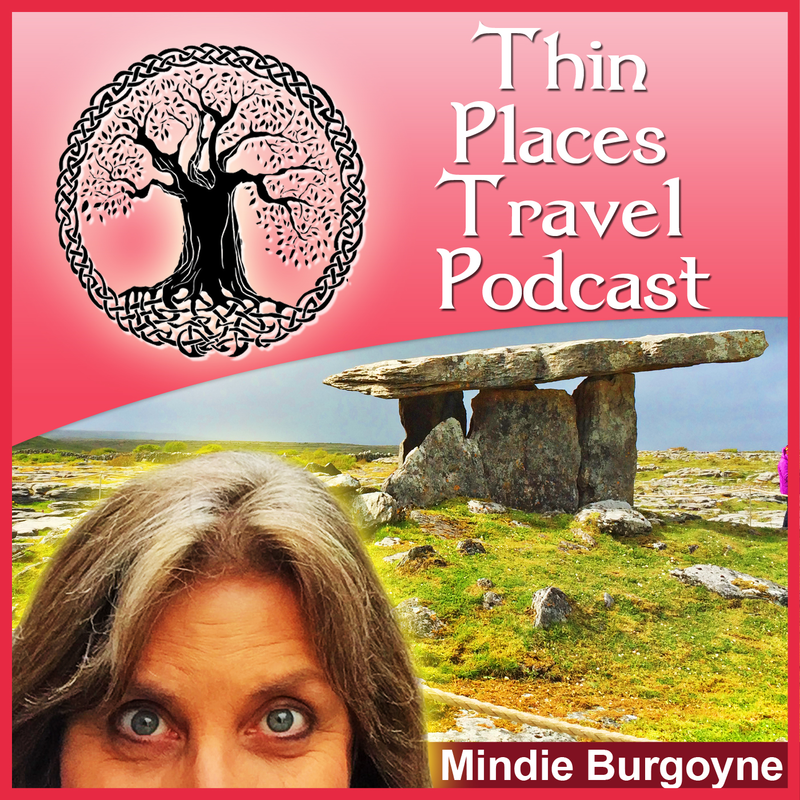 Mindie Burgoyne, author and photographer, has crafted each tour to follow a particular theme focused on a geographic region. The tours move slowly and have flexibility. They are ideal for travelers who want to move within the context of a story – the story of the landscape around them. Travelers on Thin Places Tours become images in that ancient landscape. Cost includes accommodations in 3 and 4-star hotels, all breakfasts, four dinners (including a welcome and farewell dinner), private motorcoach (often with wifi and restroom on board), full-time tour guide, additional local guides, all admissions to any attractions on the itinerary. Over 20 group excursions. Free day in a major city. 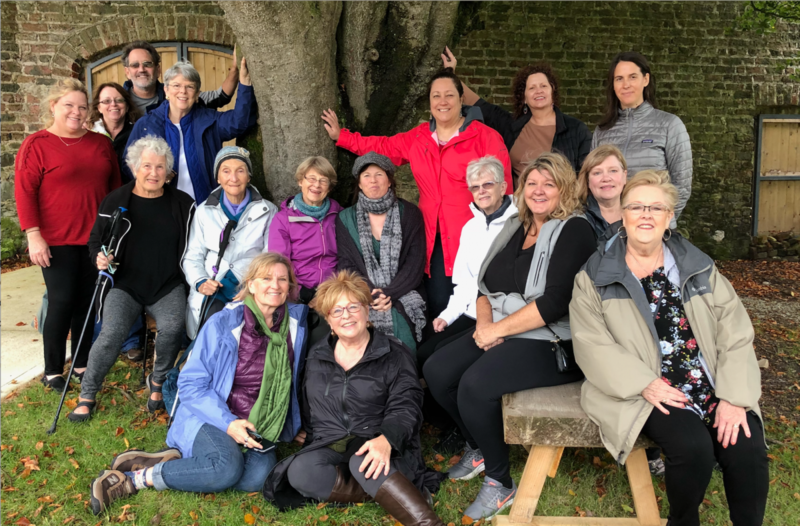 There are three group tours offered in 2019. For more information on the Thin Places Tour experience read The Thin Places Tour Experience. 5 ISLANDS – What sets this Scotland tour apart from others is the five islands that are included on the tour. Islands have always been considered sacred places – surrounded by water, all four elements come together in a mix that generates an “otherworldliness.” On this tour, guests spend two nights on Iona – a mystical, spiritual thin place that is unmatched for beauty and spiritual energy. On one of the two days spent on Iona, guests will be able to venture out to Staffa – a pillar island with rare seabirds and amazing rock formations that mirror the Giant’s Causeway in Northern Ireland. Staffa also has a sea cave with acoustics that produce a melodious musical sound. Guests will also enjoy a scenic drive across the Isle of Mull with its mountains, shadows, brilliant colors, and picturesque villages. On the first day, guests will take a short boat ride across the Lake of Menteith and visit Inchmahome (Island of my Home), a small island with the ruins of a monastery – one that sheltered little Mary Queen of Scots when her mother placed her in hiding for her protection. This island has an ancient forest with 500-year-old Spanish Chestnuts. The woodland is enchanting. On the final day, guests will visit Holy Island – also known as Lindisfarne and with the ruins of the old abbey founded by St. Aidan. Guests can also visit Cuthbert’s Isle, Lindisfarne Castle, walk a labyrinth and visit with the island locals. MONASTIC RUINS AND MEGALITHS – The tour moves within the context of the old stories of the monks of Iona who followed a sacred trail forged by kings, queens and the ancient pre-Christian people of Scotland and England. The tour also diverts to some of the stunning scenery of the Scottish Highlands with a visit to Glencoe a visit to the Fairy Knowe in Aberfoyle and the Kilmartin Valley, the home of Dunadd Fort and the largest collection of ancient monuments in Scotland. Guests will also visit Doune Castle (filming site for Game of Thrones and the Outlander Series) and Rosslyn Chapel (made famous by the DaVinci Code), Melrose Abbey and Jedburgh Abbey. Some of the stunning scenery and architecture on this tour has been featured in Harry Potter movies, Game of Thrones and the Outlander series. In 2019 there will be two back-to-back Ireland tours in September and October (with two days in between). Both will focus on the Divine Feminine. Guests will travel within the context of the “story of the Hag” and the Hag’s Journey. In Irish mythology, the Hag or Cailleach is part of the triple goddess – the older, wiser and sometimes more fearsome element of the three. The hag is known for wisdom, magic and great strength. She shapes the land. There are many stories, myths, and traditions associated with the “hag” and sites in Ireland that connect with those stories and traditions. These group tours will visit many of those sites on these two tours including sites that feature Sheela na gigs. Sites on both Ireland tours will include holy wells and mountains, sacred caves, enchanted lakes, mystical forests and images in the landscape that relate to the Divine Feminine. And many of the sites are featured for the first time on a Thin Places tour. There will also be dowsing demonstrations with dowsing rods and pendulums. Guests will be able to try for themselves to locate energy ley lines. See more information about both tours below. Note the Special “Hag’s Journey” Double Tour Rebate – $100 off total of both tours (per person). This spiritual tour of the northern region of Ireland (including Northern Ireland), The Hag’s Journey – North starts from Dublin Airport and moves into the north country – the area in Ireland that is least visited and is still relatively undeveloped. The north has an amazing energy, and the elements of the Irish countryside are magnified in this unspoiled landscape. The first stops are in County Louth – St. Brigid’s birthplace and holy well and the Hill of Ward – an ancient druidic site. Then guests will head to County Armagh and then explore sacred sites through Counties Tyrone, Derry, Donegal, Fermanagh, Sligo and some surrounding counties – 13 counties in all. Sites include passage tombs, stone circles, holy wells, natural caves, and sacred mountains. The second half of this tour traces the west to east line that of major monuments in Ireland- many affiliated with feminine deities – Carrowmore, Keshcorran, Rathcroghan, Loughcrew, and Knowth. Sites include St. Brigid’s birthplace and holy well, Bective Abbey, Navan Fort, Slieve Gullion, Lough Crew (Hill of the Hag), Beaghmore Stone Circles, St. Moninna’s Holy Well, Slieve Gallion, Inishkeel, The Rock of Doon, Caldragh Ancient Cemetery, Lisadell House, Drumcliffe (Yeats’ grave), Carrowmore Megalithic Cemetery, Knocknashee, Rathcroghan, Keshcorran Caves, the Hill of Uisneach, the Hill of Ward and finally – Knowth in the Boyne Valley. Feminine deities explored include are Brigid (both goddess and saint); Macha of Eamhain Mhacha (Navan Fort – Armagh); Aíne, sun goddess; Queen Maeve of Connaught; Ériu, from whom Ireland (Eire) takes its name; and the Cailleach – whose story stretches from the Beara Peninsula through Sligo and across to Sliabh na Cailleach – aka the Hill of the Hag – where this tour ends. Guests on this tour will visit sites and ancient monuments that are off the typical tourist routes – sites that are deep in the northern Irish landscape. *** MUSIC & STORYTELLING – This tour also includes a private evening with a traditional Irish music group, an opportunity to visit with a legendary Irish Storyteller, a free day in Sligo town and a day with Anthony Murphy of Mythical Ireland who will privately guide the tour of Loughcrew and Knowth. Read the full description of The Hag’s Journey – North and book your spot. The Hag’s Journey – West continues the story of The Hag’s Journey – North (the preceding tour) exploring the western edge of Ireland from County Mayo to County Kerry – all the way down to The Hag of Beara on the Beara Peninsula in West Cork. Guests will travel within the context of the stories of goddesses and heroic woman of Ireland including Brigid (goddess and saint), Aíne (the sun goddess), Grania (Grace) O’Malley the red-headed pirate Queen, St. Gobnait finding her places of resurrection, Dierdre of the sorrows, the Cailleach – Hag – of Beara, and Lady Augusta Gregory, a modern heroine who understood the mystical landscape of Ireland and was an integral player in the Irish Literary Renaissance. Guests will also seek out a half dozen Sheela na Gigs along the way and ponder their meaning. The tour begins in West Clare and a view of “Hag’s Head” at the Cliffs of Moher and a visit to St. Brigid’s Holy Well. Guests will travel to Lady Gregory’s Coole Park and walk in its amazing “Seven Woods” and from there go on to Lough Carra with views of “Hag Island.” Guests will visit Achill Island and the Castle of Grace O’Malley, the pirate queen who was a contemporary of Queen Elizabeth I. Then they’ll walk in the ruins of the deserted village of Slievemore, listening to the stories of a local historian and author. Guests will experience the vibrant town of Westport and take in the scenic mountains and valleys of Connemara. There will be an overnight in Galway City and a visit to Muckross Abbey in Killarney and a private walk through a magical forest. There will be a full day exploring the mystical Ring of Kerry. Final days of the tour will be spent seeing the ancient sites on the Beara Peninsula including the Hag of Beara and Uragh Stone Circle. The last day, guests will visit one of the most magical landscapes in Ireland – one that features Ireland’s largest stone circle, passage tombs, standing stones, and an enchanted lake. This tour includes a day with the archaeologist, Michael Gibbons, and an afternoon on Achill Island with Mayo writer, Patricia Byrne, author of The Veiled Woman of Achill. Read the full description of The Hag’s Journey – West tour and book your spot. Special “Hag’s Journey” Double Tour Rebate – $100 off total cost of both tours (per person). Note that tour 1 (Hag’s Journey – North) begins and ends in Dublin, and tour 2 (Hag’s Journey – West) begins and ends in the Shannon Airport region in County Clare in the west of Ireland. Guests doing both tours will be responsible for overnight accommodations for the two nights between tours, but Thin Places Tours will cover the cost of bus transport from Dublin to Shannon and help those guests wanting to do both tours locate hotel rooms for those nights in between the tours – removing the logistical efforts of getting from one place to another. This offer can also be combined with alumni discounts. Double Occupancy: Costs quoted above are based on double occupancy, meaning the cost is your share of one room. There is a $550 single supplement for a single room and a limited number of single rooms per tour. $550 single supplement is due with the deposit at time of registration. If you don’t have a roommate and would like to share a room, Thin Places Tours can try and pair you with another guest if there are other singles needing the same. Deposit and Registration secures your spot: A $500 deposit is required (plus $550 single supplement if you intend to book a single room) at the time of registration. The deposit is refundable for 30 days after it is received. After 30 days, the deposit is no longer refundable. The balance of the tour is due 60 days before the tour’s start date. Your Registration Deposit Locks in the Cost of the Tour: Due to an often fluctuating exchange rate between the US Dollar and European currencies, Thin Places Tours may increase the price of this tour before the actual date. However, once you register with your deposit, your price is locked in at the original price. This itinerary is subject to change: Because we book so far in advance and work with so many small, local businesses, situations can come up that cause us to have to make adjustments to the itinerary. We ask for our guests’ patience and flexibility.